Piano tuner Dean Petrich of Freeland, Washington, gives away pianos for the price of delivery to winnow his stash of more than 80 cast-off pianos. When you were younger, do you remember there being a piano store in your neighborhood or at the mall? There are many fewer piano dealers today than there used to be. Those who weren't done in by cheaper electronic keyboards or the last recession are changing their tunes to stay in the money. For a dramatic illustration of the economics of pianos, consider Dean Petrich's workshop and piano sheds. Petrich is a longtime piano tuner based on Whidbey Island, Washington. Dozens of upright pianos of all ages and conditions are packed in tight in Petrich's multiple sheds. 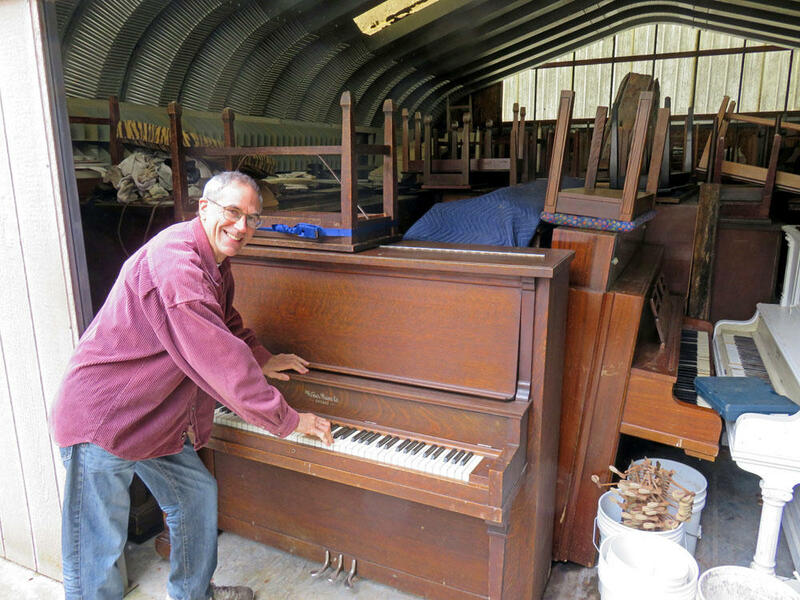 He estimated that he has about 82 pianos stored on his rural property. The prior owners gave them to Petrich for free just to get rid of them and then paid him to haul the instruments away. "As the technology for electronic instruments and keyboards has improved people have switched, because you don't have to tune an electronic keyboard,” Petrich said. “You can carry it with you, it's lightweight. It can make any sound you want." Petrich's accumulation of cast-off pianos topped out at over 200 two years ago. Now he's under 100 after giveaways, restorations or dismantling and recycling. "I am getting more creative for what to do with old pianos," he said. The irrepressible tuner has a book in the works describing how every part of a piano can be repurposed. Petrich also donated 10 pianos to Cambodia recently and another batch of 20 has just shipped to Vietnam to benefit needy schools there. Petrich strikes a hopeful note because of the upturn in the economy. Music Trades reported 30,806 grand pianos and vertical pianos sold through retailers in 2016. That compares to 53,870 new acoustic piano sales in 2007. Curt Clinton is the fourth generation of his family to run Clinton's Music House, and he said, maybe the last. The piano dealership was founded in 1898 in Tacoma. Clinton recalled organs "were selling like crazy" along with new pianos when he took over in 1978 and moved to Olympia’s Capital Mall. He remembered having nine competitors in the city back then. Now it's just him and a couple of professional tuners who sell pianos on the side. "As that evolved over the years and more and more keyboards started coming out, that business kind of shrunk,” Clinton said. “As that business shrunk and the mall business shrunk and we started moving out of the malls, we needed to find something else." Clinton moved out of the mall in 1997 because it got too expensive to operate there. He said his piano business has required "continual" reinvention to survive. Refurbishing and reselling "good used pianos" is now the major part of his business. "You always have to have that feeler out looking for that used piano that some family is done with, something that's decent that we can pick up and make into a good piano again,” Clinton said. In Oregon, Portland Piano Company, is surviving by moving out of downtown this summer to a cheaper warehouse district near the airport and by investing in online marketing. Families who immigrated here from East Asia and India represent an increasing share of the customer base. "If it weren't for them, I don't know what we would do," said company manager Brenda Kell. Kell said she never would have thought that selling pianos over the internet would work, but that is what's happening. "It's all about price,” she said. “It's very strange for us who have been in the business for a long time." The website Craigslist is awash in free pianos. But all of the professionals in the piano business pointed out that the actual cost is likely far from free when you have to move a piano and fix it up. "On a positive note, the downward trend in new piano sales tends to obscure the continued interest in playing the piano,” Music Trades said in its annual Music Industry Census published in April. “Music publishers, for their part, report continued strength in piano method book sales."